Today is National Radio Day. Every August 20th, since the early 1990s, this special day has been set aside for people all over the world to pay tribute to the communications medium that launched a thousand dramas, news broadcasts and wacky deejays. 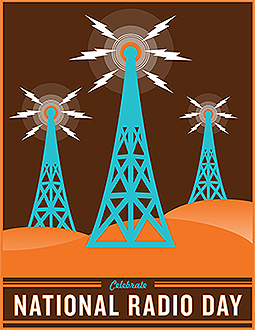 As the National Radio Day website points out, “8MK (now WWJ) in Detroit, first broadcast on August 20, 1920.” So the radio phenomenon has been around awhile and it’s still kicking. Although National Radio Day generally concerns itself with what used to be called traditional radio stations, we here at Pure Pop Radio wish to extend the celebration to cover Internet radio concerns. Cyberspace broadcasters are providing, along with their over-the-air counterparts, specialized listening experiences that target specific musical tastes, a thirst for domestic and international news and opinion, and countless other formats that serve the needs of listeners around the globe. I always wanted to be on the radio. When I was a kid, I had a toy radio base station that came with a CB-like microphone and a wire that you hung out the window to push your “signal” out to waiting listeners, which in reality translated to the neighbor living next door. I would push in the microphone’s talk button and put it next to the speaker on my little record player and blast the cool tunes. I was, in fact, the neighborhood’s coolest deejay. I lived and breathed radio. 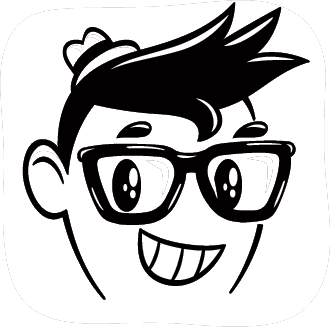 I listened to everything I could, from news programs to the music stations of the day that played a truly eclectic selection of songs from a variety of genres. It wasn’t abnormal to hear a show tune followed by a folk song and the latest Beatles record. I used to sit at the kitchen table in my grandfather’s house, listening to WABC-AM, and writing down each and every song they played until I figured out how long it took for particular songs to be played again, thereby learning the secret of top 40 radio. When I graduated from college, I headed for the local Federal Communications Commission office and got my third-class ticket (I just passed, getting all of the math questions wrong, related to taking transmitter readings). I went to Dover, Delaware to work at WKEN-AM, where I Iearned what not to do, and quickly moved to WAFL-FM, where I learned how to make great radio the right way from people who were as passionate about the medium as I was. Plus, I got to interview a guy who owned the largest alligator in the world and talk to Miss Agriculture from the state fair, who proceeded to yodel and cause me to visit the ear, nose and throat doctor after my right ear clogged up. But that’s another story. Cut to a move back to New York, followed by a move to Virginia and, eventually, the start of Pure Pop Radio in 1995. Here I am, 20 years later, still at it, playing the greatest melodic pop music in the universe. Who would have thunk it? Certainly not I. But what I do know is that once you get radio in your blood, you never are able to shake the urge to sit before a microphone and communicate with listeners. You never tire of introducing records or saying something funny or sad or ironic, or reporting the news or wishing someone a happy birthday or anniversary. You never tire of making people happy, which is what it’s all about. 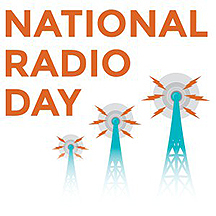 So on this day, National Radio Day, I tip my hat to all of those radio warriors who work day in and day out to connect with the world and share a thought that might just change somebody’s mood or outlook on life. Turn on your radio, whether it be terrestrial, satellite or Internet-based, and connect with the person behind the microphone. He or she is ready to change your lives.